Oshiage (押上) is located east of Asakusa. 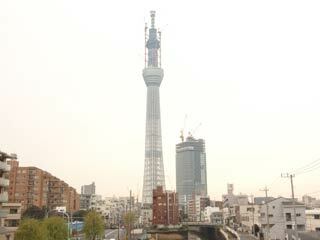 The main feature of Oshiage is Tokyo Sky Tree. Tokyo Sky Tree will be 634m tall and the 2nd tallest building in the world and the tallest tower in the world. From Oshiage station, you can see it form the bottom to feel how high it is. Sky Tree will finish its construction by December 2011. Oshiage is located in Sumida ward in Tokyo. The town exists since Edo Period.